I love Jane Goodall. She is my hero, plain and simple. I mean, I know, who doesn't love Jane? Like so many, I grew up watching her in National Geographic specials on tv, and reading about her and her beloved chimpanzees in NG magazine. Few have not seen those now iconic images of a young, blond English woman hiking Gombe, and living what seemed to be an idyllic life amongst the apes. When Jane began her research in Africa, she was not a formally trained scientist, and indeed this was one of the reasons Dr. Louis Leakey felt so strongly that she was perfect for studying chimpanzees. Her maverick (can I still use this word post Sarah Palin?) 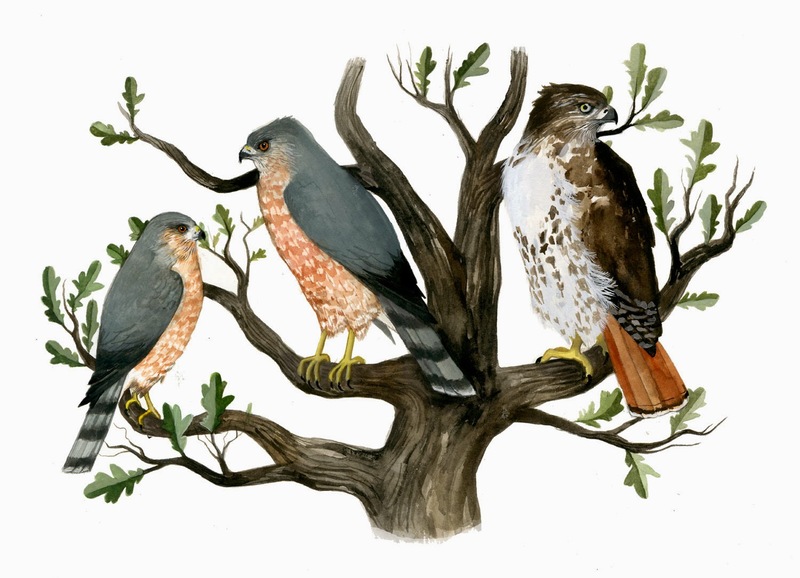 approach to studying these animals, led her to revolutionary discoveries that we now take for granted. The most famous being her witnessing tool use by the Gombe chimps. Dr. Goodall to this day quotes Dr. Leakey as saying "We must now redefine man, redefine tool, or accept chimpanzees as human." In addition to all of Dr. Goodall's achievements, she is, above all an extremely compassionate person. Her undeniable empathy and compassion for chimpanzees and all other life, has influenced me and so many others in terms of how we think about the natural world and how we treat animals. And in her humility, Jane never credits herself for this, but instead credits the chimpanzees, seeing herself merely as interpreter. Over many years life has changed a lot from those early idyllic times for Jane and the Gombe chimps. When she began her research, Dr. Goodall was of the mind that chimpanzees were just like us, but better: more peaceful, and loving. But as the years went on, she was to witness the darker sides of chimpanzee behavior: violence, infanticide and a bloody 'war' between two Gombe chimp groups that lasted 4 years, resulting in the deaths of every single member of one of the groups. In addition to these more troubling discoveries, she and the chimps have witnessed tremendous destruction of the habitat that surrounds the tiny 30 mile sliver that makes up the Gombe Reserve. Chimp numbers have plummeted due to habitat loss and a major spike in bushmeat hunting. It is for these reasons that Dr. Goodall decided to leave her beloved Gombe in the 1980s, to spend what now amounts to 300 days a year tirelessly working as an ambassador for the chimps and environment. I could go on, but will try to wrap this up. 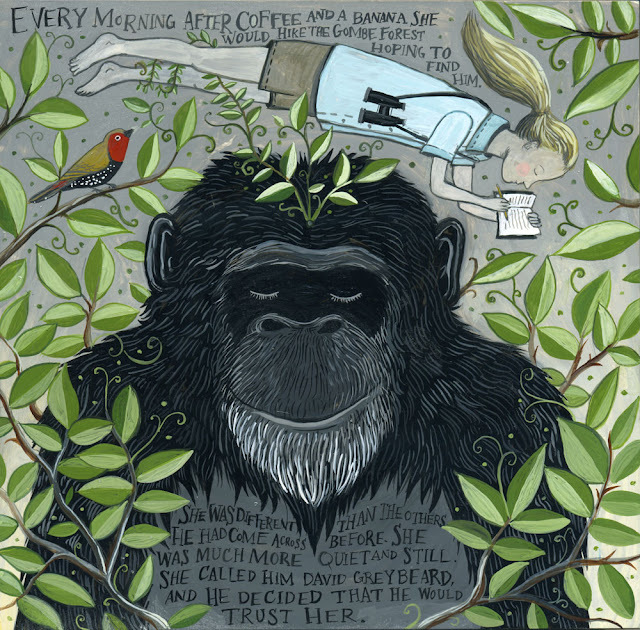 About my painting: David Greybeard was the first chimp that accepted Jane's presence. It was with him that she first observed tool usage amongst the chimps. She observed David and others using modified twigs to fish out termites from mounds. David Greybeard was a large, gentle male, distinguished by grey hairs on his chin, hence her name for him. Jane often was barefoot, but never without her binoculars and notepad. The bird is a Peter's Twinspot, a species that is found within the reserve. The painting is not for sale, but if there is enough interest I may make a very small (15?) print edition. Beautiful painting and a lovely post. Brink, don't call me Shirley and you still have my book! Oh, and I forgot to say, YES I would buy a print. Maybe two! I have a friend who would also love it. This is a great homage. I too would purchase a print if you decide to print a small edition. I found your blog via irideeen. This post made me cry in a good way. Jane is also my hero and I am very thankful for this painting. Thank you Diana.